Also found in: Dictionary, Thesaurus, Encyclopedia, Wikipedia. Angiography is the x-ray study of the blood vessels. An angiogram uses a radiopaque substance, or dye, to make the blood vessels visible under x ray. Arteriography is a type of angiography that involves the study of the arteries. Angiography is used to detect abnormalities or blockages in the blood vessels (called occlusions) throughout the circulatory system and in some organs. The procedure is commonly used to identify atherosclerosis; to diagnose heart disease; to evaluate kidney function and detect kidney cysts or tumors; to detect an aneurysm (an abnormal bulge of an artery that can rupture leading to hemorrhage), tumor, blood clot, or arteriovenous malformations (abnormals tangles of arteries and veins) in the brain; and to diagnose problems with the retina of the eye. It is also used to give surgeons an accurate "map" of the heart prior to open-heart surgery, or of the brain prior to neurosurgery. Arteriosclerosis — A chronic condition characterized by thickening and hardening of the arteries and the build-up of plaque on the arterial walls. Arteriosclerosis can slow or impair blood circulation. Carotid artery — An artery located in the neck. Catheter — A long, thin, flexible tube used in angiography to inject contrast material into the arteries. Cirrhosis — A condition characterized by the destruction of healthy liver tissue. A cirrhotic liver is scarred and cannot break down the proteins in the bloodstream. Cirrhosis is associated with portal hypertension. Embolism — A blood clot, air bubble, or clot of foreign material that travels and blocks the flow of blood in an artery. When blood supply to a tissue or organ is blocked by an embolism, infarction, or death of the tissue the artery feeds, occurs. Without immediate and appropriate treatment, an embolism can be fatal. Femoral artery — An artery located in the groin area that is the most frequently accessed site for arterial puncture in angiography. Fluorescein dye — An orange dye used to illuminate the blood vessels of the retina in fluorescein angiography. Fluoroscopic screen — A fluorescent screen which displays "moving x-rays" of the body. Fluoroscopy allows the radiologist to visualize the guide wire and catheter he is moving through the patient's artery. Guide wire — A wire that is inserted into an artery to guides a catheter to a certain location in the body. Iscehmia — A lack of normal blood supply to a organ or body part because of blockages or constriction of the blood vessels. Necrosis — Cellular or tissue death; skin necrosis may be caused by multiple, consecutive doses of radiation from fluoroscopic or x-ray procedures. Plaque — Fatty material that is deposited on the inside of the arterial wall. Portal hypertension — A condition caused by cirrhosis of the liver. It is characterized by impaired or reversed blood flow from the portal vein to the liver, an enlarged spleen, and dilated veins in the esophagus and stomach. Portal vein thrombosis — The development of a blood clot in the vein that brings blood into the liver. Untreated portal vein thrombosis causes portal hypertension. Patients with kidney disease or injury may suffer further kidney damage from the contrast mediums used for angiography. Patients who have blood clotting problems, have a known allergy to contrast mediums, or are allergic to iodine, a component of some contrast mediums, may also not be suitable candidates for an angiography procedure. Because x rays carry risks of ionizing radiation exposure to the fetus, pregnant women are also advised to avoid this procedure. Angiography is usually performed at a hospital by a trained radiologist and assisting technician or nurse. It takes place in an x-ray or fluoroscopy suite, and for most types of angiograms, the patient's vital signs will be monitored throughout the procedure. 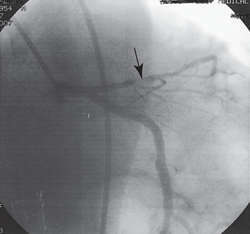 Angiography requires the injection of a contrast dye that makes the blood vessels visible to x ray. The dye is injected through a procedure known as arterial puncture. The puncture is usually made in the groin area, armpit, inside elbow, or neck. The site is cleaned with an antiseptic agent and injected with a local anesthetic. First, a small incision is made in the skin to help the needle pass. A needle containing an inner wire called a stylet is inserted through the skin into the artery. When the radiologist has punctured the artery with the needle, the stylet is removed and replaced with another long wire called a guide wire. It is normal for blood to spout out of the needle before the guide wire is inserted. The guide wire is fed through the outer needle into the artery and to the area that requires angiographic study. A fluoroscopic screen that displays a view of the patient's vascular system is used to pilot the wire to the correct location. Once it is in position, the needle is removed and a catheter is slid over the length of the guide wire until it to reaches the area of study. The guide wire is removed and the catheter is left in place in preparation for the injection of the contrast medium, or dye. Depending on the type of angiography procedure being performed, the contrast medium is either injected by hand with a syringe or is mechanically injected with an automatic injector connected to the catheter. An automatic injector is used frequently because it is able to propel a large volume of dye very quickly to the angiogram site. The patient is warned that the injection will start, and instructed to remain very still. The injection causes some mild to moderate discomfort. Possible side effects or reactions include headache, dizziness, irregular heartbeat, nausea, warmth, burning sensation, and chest pain, but they usually last only momentarily. To view the area of study from different angles or perspectives, the patient may be asked to change positions several times, and subsequent dye injections may be administered. During any injection, the patient or the camera may move. Throughout the dye injection procedure, x-ray pictures and/or fluoroscopic pictures (or moving x rays) will be taken. Because of the high pressure of arterial blood flow, the dye will dissipate through the patient's system quickly, so pictures must be taken in rapid succession. An automatic film changer is used because the manual changing of x-ray plates can eat up valuable time. Once the x rays are complete, the catheter is slowly and carefully removed from the patient. Pressure is applied to the site with a sandbag or other weight for 10-20 minutes in order for clotting to take place and the arterial puncture to reseal itself. A pressure bandage is then applied. Cerebral angiography is used to detect aneurysms, blood clots, and other vascular irregularities in the brain. The catheter is inserted into the femoral or carotid artery and the injected contrast medium travels through the blood vessels on the brain. Patients frequently experience headache, warmth, or a burning sensation in the head or neck during the injection portion of the procedure. A cerebral angiogram takes two to four hours to complete. Coronary angiography is administered by a cardiologist with training in radiology or, occasionally, by a radiologist. The arterial puncture is typically given in the femoral artery, and the cardiologist uses a guide wire and catheter to perform a contrast injection and x-ray series on the coronary arteries. The catheter may also be placed in the left ventricle to examine the mitral and aortic valves of the heart. If the cardiologist requires a view of the right ventricle of the heart or of the tricuspid or pulmonic valves, the catheter will be inserted through a large vein and guided into the right ventricle. The catheter also serves the purpose of monitoring blood pressures in these different locations inside the heart. The angiogram procedure takes several hours, depending on the complexity of the procedure. Pulmonary, or lung, angiography is performed to evaluate blood circulation to the lungs. It is also considered the most accurate diagnostic test for detecting a pulmonary embolism. The procedure differs from cerebral and coronary angiograms in that the guide wire and catheter are inserted into a vein instead of an artery, and are guided up through the chambers of the heart and into the pulmonary artery. Throughout the procedure, the patient's vital signs are monitored to ensure that the catheter doesn't cause arrhythmias, or irregular heartbeats. The contrast medium is then injected into the pulmonary artery where it circulates through the lung capillaries. The test typically takes up to 90 minutes. Patients with chronic renal disease or injury can suffer further damage to their kidneys from the contrast medium used in a kidney angiogram, yet they often require the test to evaluate kidney function. These patients should be well-hydrated with a intravenous saline drip before the procedure, and may benefit from available medications (e.g., dopamine) that help to protect the kidney from further injury due to contrast agents. During a kidney angiogram, the guide wire and catheter are inserted into the femoral artery in the groin area and advanced through the abdominal aorta, the main artery in the abdomen, and into the renal arteries. The procedure will take approximately one hour. Fluorescein angiography is used to diagnose retinal problems and circulatory disorders. It is typically conducted as an outpatient procedure. The patient's pupils are dilated with eye drops and he rests his chin and forehead against a bracing apparatus to keep it still. Sodium fluorescein dye is then injected with a syringe into a vein in the patient's arm. The dye will travel through the patient's body and into the blood vessels of the eye. The procedure does not require x rays. Instead, a rapid series of close-up photographs of the patient's eyes are taken, one set immediately after the dye is injected, and a second set approximately 20 minutes later once the dye has moved through the patient's vascular system. The entire procedure takes up to one hour. Celiac and mesenteric angiography involves x-ray exploration of the celiac and mesenteric arteries, arterial branches of the abdominal aorta that supply blood to the abdomen and digestive system. The test is commonly used to detect aneurysm, thrombosis, and signs of ischemia in the celiac and mesenteric arteries, and to locate the source of gastrointestinal bleeding. It is also used in the diagnosis of a number of conditions, including portal hypertension, and cirrhosis. The procedure can take up to three hours, depending on the number of blood vessels studied. A splenoportograph is a variation of an angiogram that involves the injection of contrast medium directly into the spleen to view the splenic and portal veins. It is used to diagnose blockages in the splenic vein and portal vein thrombosis and to assess the strength and location of the vascular system prior to liver transplantation. Most angiography procedures are typically paid for by major medical insurance. Patients should check with their individual insurance plans to determine their coverage. Patients undergoing an angiogram are advised to stop eating and drinking eight hours prior to the procedure. They must remove all jewelry before the procedure and change into a hospital gown. If the arterial puncture is to be made in the armpit or groin area, shaving may be required. A sedative may be administered to relax the patient for the procedure. An IV line will also be inserted into a vein in the patient's arm before the procedure begins in case medication or blood products are required during the angiogram. Prior to the angiography procedure, patients will be briefed on the details of the test, the benefits and risks, and the possible complications involved, and asked to sign an informed consent form. Because life-threatening internal bleeding is a possible complication of an arterial puncture, an overnight stay in the hospital is sometimes recommended following an angiography procedure, particularly with cerebral and coronary angiograms. If the procedure is performed on an outpatient basis, the patient is typically kept under close observation for a period of at six to 12 hours before being released. If the arterial puncture was performed in the femoral artery, the patient will be instructed to keep his leg straight and relatively immobile during the observation period. The patient's blood pressure and vital signs will be monitored and the puncture site observed closely. Pain medication may be prescribed if the patient is experiencing discomfort from the puncture, and a cold pack is applied to the site to reduce swelling. It is normal for the puncture site to be sore and bruised for several weeks. The patient may also develop a hematoma, a hard mass created by the blood vessels broken during the procedure. Hematomas should be watched carefully, as they may indicate continued bleeding of the arterial puncture site. Angiography patients are also advised to enjoy two to three days of rest and relaxation after the procedure in order to avoid placing any undue stress on the arterial puncture. Patients who experience continued bleeding or abnormal swelling of the puncture site, sudden dizziness, or chest pains in the days following an angiography procedure should seek medical attention immediately. Patients undergoing a fluorescein angiography should not drive or expose their eyes to direct sunlight for 12 hours following the procedure. Because angiography involves puncturing an artery, internal bleeding or hemorrhage are possible complications of the test. As with any invasive procedure, infection of the puncture site or bloodstream is also a risk, but this is rare. A stroke or heart attack may be triggered by an angiogram if blood clots or plaque on the inside of the arterial wall are dislodged by the catheter and form a blockage in the blood vessels or artery. The heart may also become irritated by the movement of the catheter through its chambers during pulmonary and coronary angiography procedures, and arrhythmias may develop. Patients who develop an allergic reaction to the contrast medium used in angiography may experience a variety of symptoms, including swelling, difficulty breathing, heart failure, or a sudden drop in blood pressure. If the patient is aware of the allergy before the test is administered, certain medications can be administered at that time to counteract the reaction. Angiography involves minor exposure to radiation through the x rays and fluoroscopic guidance used in the procedure. Unless the patient is pregnant, or multiple radiological or fluoroscopic studies are required, the small dose of radiation incurred during a single procedure poses little risk. However, multiple studies requiring fluoroscopic exposure that are conducted in a short time period have been known to cause skin necrosis in some individuals. This risk can be minimized by careful monitoring and documentation of cumulative radiation doses administered to these patients. The results of an angiogram or arteriogram depend on the artery or organ system being examined. Generally, test results should display a normal and unimpeded flow of blood through the vascular system. Fluorescein angiography should result in no leakage of fluorescein dye through the retinal blood vessels. Abnormal results of an angiography may display a restricted blood vessel or arterial blood flow (ischemia) or an irregular placement or location of blood vessels. The results of an angiography vary widely by the type of procedure performed, and should be interpreted and explained to the patient by a trained radiologist. Baum, Stanley, and Michael J. Pentecost, editors. Abrams' Angiography. 4th ed. Philadelphia: Lippincott-Raven, 1996.
radiography of vessels of the body after injection of contrast material; see also arteriography, lymphangiography, and phlebography. Called also vasography. digital subtraction angiography radiographic visualization of blood vessels, with images produced by subtracting background structures and enhancing the contrast of those areas that change in density between a preliminary “mask” image and subsequent images. Radiography of vessels after the injection of a radiopaque contrast material; usually requires percutaneous insertion of a radiopaque catheter and positioning under fluoroscopic control. intra-arterial digital subtraction angiography a radiologic imaging technique for arteriography that uses electronic circuitry to subtract the background of bone and soft tissue from the image of the arteries, which have been injected with contrast material. intravenous digital subtraction angiography a fluoroscopic imaging technique in which electronic circuitry is used to subtract the background of bone and soft tissue and provide a useful image of vessels following the injection of contrast medium. magnetic resonance angiography (MRA) a form of magnetic resonance imaging used to study blood vessels and blood flow. Radiographic visualization of the blood vessels following the injection of a radiopaque substance. the x-ray visualization of the internal anatomy of the heart and blood vessels after the intravascular introduction of radiopaque contrast medium. The procedure is used as a diagnostic aid in myocardial infarction, vascular occlusion, calcified atherosclerotic plaques, cerebrovascular accident, portal hypertension, renal neoplasms, renal artery stenosis as a causative factor in hypertension, pulmonary emboli, and congenital and acquired lesions of pulmonary vessels. The contrast medium may be injected into an artery or vein or introduced into a catheter inserted in a peripheral artery and threaded through the vessel to a visceral site. Because the iodine in the contrast medium may cause a marked allergic reaction in some patients and may lead to death in severe cases, testing for hypersensitivity is indicated before the radiopaque substance is used. Because iodinated contrast agents are nephrotoxic, renal function also must be determined before angiography. After the procedure the patient is monitored for signs of bleeding at the puncture site, and bed rest for a number of hours is indicated. angiographic, adj. An imaging technique for evaluating vascular defects in the form of arterial or venous obstruction, in which a radiocontrast medium is injected into a vessel of interest in order to evaluate anatomy, in particular stenoses and thrombosis. When initial non-invasive procedures (CT, MRI) fail to reveal the cause of a suspected defect. 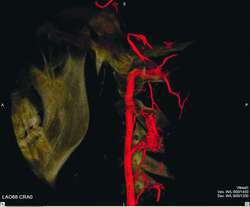 Imaging A radiographic technique for evaluating vascular defects in the form of arterial or venous obstruction, in which radiocontrast is injected into a vessel of interest in order to evaluate anatomy Indications When initial non-invasive procedures–CT, MRI fail to reveal the cause of a suspected defect. See Cardiac catherization, Cerebral angiography, Coronary angiography, Digital subtraction angiography, Directional color angiography, Equilibrium radionuclide angiography, Fluorescein angiography, Lymphangiography, Magnetic resonance angiography, Magnetic resonance coronary angiography, Percutaneous transluminal cerebral angiography, Percutaneous transluminal coronary angiography, Pulmonary angiography, Transluminal angiography. 1. A description of blood vessels and lymphatics. 2. Diagnostic or therapeutic radiography of the heart and blood vessels with a radiopaque contrast medium. Types include magnetic resonance angiography, interventional radiology, and computed tomography. Before the procedure: health care professionals explain to the patient how a needle or catheter will be used to penetrate a blood vessel, and that a contrast agent will be injected into it to highlight the course of the vessel (map the vessel) and any abnormalities in it or associated with it. These abnormalities may include widenings and weaknesses in the blood vessels (aneurysms); narrowings of the vessel (stenoses or obstructions); abnormal connections between arteries and veins (fistulae); or unusual networks of vessels (arteriovenous malformations or in some cases, the complex blood supply of malignant tumors). Complications of angiography include damage to the blood vessel or neighboring tissues, bleeding or bruising, cardiac arrhythmias, syncope, infection, or, in very rare instances, death. These potential complications should be fully reviewed with the patient during the informed consent that precedes the procedure. During the procedure: the patient’s heart rate and rhythm are closely monitored, along with his or her blood pressure, oxygenation, mental status, and in critically ill patients, urinary output. The patient may experience a hot flush during the injection of contrast, palpitations, or other unusual sensations. These sensations should be explained to the patient before they occur to minimize anxiety. Anxiolytics or sedatives may sometimes be administered to patients as needed. After the procedure: the puncture site is tamponaded and bandaged and then monitored for signs of bleeding or bruising. The part of the body distal to the puncture site is periodically assessed for pulse, color, warmth, sensation, and movement. The patient is permitted to mobilize only after the puncture site is stabilized and institutional protocols are completed. Angiography of the aorta and its branches. Angiography of the heart and coronary arteries. Angiography performed after a small tube is placed in a blood vessel and a contrast medium is injected to outline the internal structure of the blood vessel. Angiography of the vascular system of the brain. Angiography of the coronary arteries to determine any pathological obstructions to blood flow to the heart muscle. It is used to provide definitive images of the coronary arteries that reveal atherosclerotic blockage to blood flow so that those blockages can be surgically bypassed, opened (with angioplasty or stenting, for example), or treated with medications. Potential hazards of the procedure include coronary artery dissection, kidney failure resulting from exposure to angiographic contrast, and radiation exposure. The best contemporary test to assess a patient suspected of having a pulmonary embolism The test uses computed tomographic imaging of the pulmonary arteries to identify blood clots in the right ventricular outflow tracts or the pulmonary arteries. The presence of a clot indicates the need for treatment with anticoagulant drugs. It is used as the generally preferred alternative to invasive pulmonary angiography (which, while accurate, requires right ventricular catheterization), or to ventilation/perfusion scanning of the lungs (which often yields indeterminate results). Potential hazards of the test include its radiation exposure, its risk for renal failure (esp. in patients with predisposing conditions for kidney injury), and the risk of allergy to the radiological contrast agent used in the test. Use of a computer to investigate arterial blood circulation. A reference image is obtained by fluoroscopy. Then a contrast medium is injected intravenously. Another image is produced from the fluoroscopic image, after which the computer technique subtracts the image produced by surrounding tissues. The third image is an enhanced view of the arteries. The optimal diagnostic test to evaluate the vascular status of the retina and choroid. Fluorescein dye is injected into an arm vein and sequential photographs are taken of the fundus as the dye circulates at different time intervals. Noninvasive imaging of blood vessels by magnetic resonance imaging. The technique does not expose patients to ionizing radiation and avoids catheterization of the vessels. It has been used to study aneurysms, blockages, and other diseases of the carotid, coronary, femoral, iliac, and renal arteries. Studies may be done with or without contrast agents. 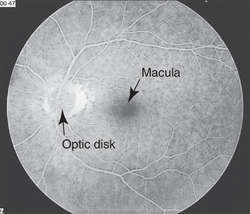 A laser imaging test to identify abnormal blood vessels in the choroidal layer beneath the retina. These abnormal vessels may leak, causing central visual field loss in age-related macular degeneration. Angiography of the pulmonary vessels (e.g., in the diagnosis of pulmonary embolism). Angiography in which a catheter is introduced directly into the vessel to be visualized. A form of X-ray examination using a CONTRAST MEDIUM which renders the blood visible in blood vessels into which it has been injected. 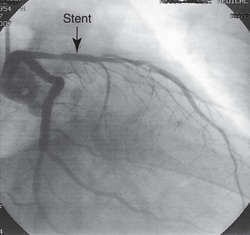 Angiography does not show the vessels themselves, but outlines the shape of the blood column. A fine tube (catheter) is used to direct the contrast medium to the required place. See also DIGITAL SUBTRACTION ANGIOGRAPHY. Radiography of vessels after injecting radiopaque contrast material; usually requires percutaneous insertion of a radiopaque catheter and positioning under fluoroscopic control. n the radiographic visualization of the internal anatomy of the heart and blood vessels after the intravascular introduction of radiopaque contrast medium. radiological demonstration of certain areas of the vascular system by the injection of a radiopaque solution (arteriography, lymphangiography or phlebography). radiography of the cranium after the intravenous injection of a radiopaque substance. An area of poor vascularity indicates the presence of a space-occupying lesion in the brain. intravenous fluorescein can be visualized in retinal and iris vasculature with the use of blue filters and direct or indirect ophthalmoscopy or photography. See also vitreous fluorophotometry. injection of contrast material into a regional vessel or the general circulation. contrast study of the arteries of the orbit, particularly the malar, infraorbital, maxillary and dorsal orbital, using the infraorbital artery for injection of a suitable medium. demonstration of pulmonary veins and arteries by introduction of contrast material into the jugular or cephalic vein or via a catheter positioned in the pulmonary artery. outlines renal blood flow, usually via a catheter introduced into the femoral artery and passed retrograde into the aorta to the vicinity of the renal arteries. placement of the catheter in the vessel or heart chamber being studied in order to provide the best possible contrast study of the suspected lesion. However, studies, comparing the complication rate between patients who underwent angiography for sub-arachnoid haemorrhage (SAH) and the patients who underwent angiography for indications other than SAH are lacking. Cutting unnecessary angiography is really important to patients, and it may also be cost effective," he said, but cautioned that a formal cost analysis of the options tested in this study is still being run. In conclusion, this is a rare study of normal values and reproducibility of flow indexes using RTVue XR with AngioVue to perform quantitative angiography in normal monkey eyes. Patients were subjected to colour Doppler ultrasonography and MDCT angiography. The global digital subtraction angiography market is classified on the basis of product type, technology, indication, procedures, end user and region. In age-related macular degeneration, diabetic retinopathy, central retinal vein occlusion and other vascular conditions, AngioPlex OCT Angiography can complement traditional FA and become a safe and efficient part of routine eye care, potentially enabling earlier detection and management of micro-progressions. Applying x-ray in angiography and angioplasty operations imposes many side effects on a patient's genetics and body system", Haji Babayee asserted, "after collision of X-ray with cells some physical effects such as ionizing heat and subsequent chemical and biological effects causing irreparable damage to living cells occur which depending on the severity, may include redness of the skin, minor burns, hair loss, bleeding, infertility, necrosis and cell death. CT angiography has a sensitivity and specificity of 95. Transient cortical blindness can also be seen in the absence of contrast enhancement at computed tomography scan after coronary angiography. CT angiography requires complex computer technology and algorithms as well as substantial operator experience and judgment to interpret image data. However our study is significant because it shows radiologists are able to significantly decrease the radiation dose delivered to the patient during CT angiography," said Dr. In medium-to high-risk cardiac patients who need major vascular surgery, coronary angiography should be done routinely because it improves long-term outcomes, Italian researchers report in the September 8th issue of the Journal of the American College of Cardiology.